The Dreaded Paleo Perfectionist | Gourmet B.C. For this week’s blog challenge, my group decided to talk about the extremists in our area of blogging. For paleos, this is the dreaded “paleo perfectionist” (also called “paleo police”). What’s a paleo perfectionist? Well, I’ll tell you. They think they’re paleo.. and perfect. Yes! That is paleo perfectionism.. Sort of! A paleo perfectionist is one who thinks that paleo is an all-or-nothing diet. They chastise innocent people on the internet who do not follow paleo 100% of the time. They leave nasty comments on Instagram, Facebook, Twitter, and blog feeds. It’s almost like they feed off of giving other people negative energy. They will judge you before even getting to know you (by what you eat, of course). If you deviate from the “rules” of paleo, you’re out of the club. Didn’t you know you had to follow paleo 100% of the time?! WELL!? DIDN’T YOU?! These paleo perfectionists do not represent a majority of the paleo population, and they certainly do not represent me. The great thing about paleo is that you get to judge what is good for your body. When you ate that strawberry, did it make you feel good? Then by all means, continue to eat them! Did that banana that made you feel sick? Maybe you should leave it out. That is the philosophy of paleo. (Also, here is another great philosophy on paleo treats). 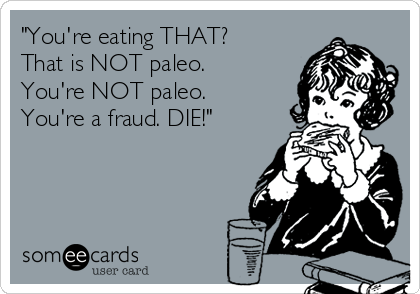 Of course, you will hear paleo described as: legume-free, dairy-free, grain-free, etc. Yes, this is true. Most people do encompass these things.. For a majority of the time. Let’s take me for example. I am not a paleo perfectionist in any way. I don’t police other people expecting them to be paleo day in and day out. I think it’s an unrealistic expectation in the world that we live in for people be paleo in every way, shape, and form. It just doesn’t fit people’s lifestyle to never eat any processed foods. I quite enjoy my goat milk yogurt that comes in a container, thank you, and I think I’ll keep eating it because it’s delicious. In fact, I’m not afraid to admit that just last night I had a gluten-free (not grain-free! gasp!) cookie from a PACKAGE. YES! 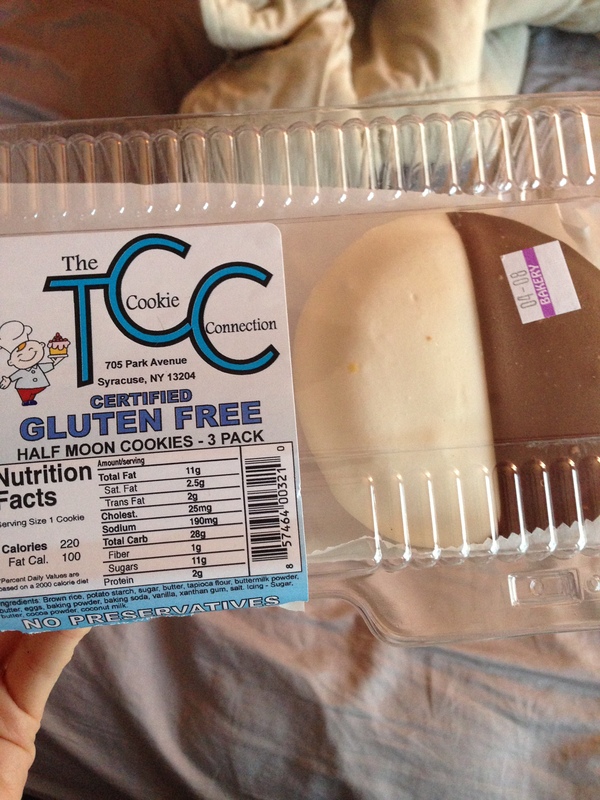 (Side note: these cookies were amazing, and you should buy them. Additionally, I don’t necessarily think these are 100% processed because there are no preservatives) I ate a processed food. Why? Well, because my dad bought it for me, and I wanted to eat it. So I ate it. And it was delicious. SO THERE. What are you gonna do, scream at me? Gluten free cookie. Sorry for the terrible photography: this was never meant to be seen by anyone else! I would say that I am in tune with my body, and I put science behind it. I don’t say, “well, I’m gonna eat that lamb heart tonight, because it is DARNNNN tasty!” Lamb heart isn’t actually that bad, but I eat lamb heart because it’s nutritious for my body. Offal is the most nutritiously dense meat you can eat, so I eat it. There’s a general 80/20 rule to paleo: most people eat paleo 80% of the time, 20% not paleo. Of course, this doesn’t mean going to Taco Bell once a week because Taco Bell isn’t even food; I’m convinced it’s cardboard or something. Anyway, you’d just be adding a whole bunch of chemicals to your body that shouldn’t be there, and obviously that is very bad. 20% maybe means you have a gluten-free cookie once a week, or something. So, what’s the lesson of the day? Back off, paleo perfectionists. Stop policing people. We don’t care what you think of our diet or our lives. We don’t care if something isn’t paleo. We just want to do something that makes our bodies feel good. We want to heal our insides and our outsides. We want you to leave us alone. And not just paleos, so do those “annoying vegans“! And don’t even get me started on any nutrition police. Let us be us. This entry was posted in Rant and tagged cookie, delicious, food, foodie, goat milk, make it work, notapaleoperfectionist, paleo, paleo perfectionism, paleo perfectionist, redwood hill, sugar, the cookie connection, yogurt, yummy by Brittany W. Bookmark the permalink.